For those of us who enjoy shorter stories that feature Batman, we have another book to buy besides Legends of The Dark Knight. This is a good example of how an anthology book is done. Both the stories and the art utilize a wide variety of styles. If you will only buy color comics, this won’t be to your liking! Will Batman eventually run out of steam? DC needs to be careful about over-exposure! Previously in Batman: Black and White: “The legendary, Eisner Award-winning series BATMAN: BLACK AND WHITE returns in a brand-new six-issue miniseries featuring tales of The Dark Knight by some of comics’ greatest writers and artists! This first issue kicks off with stories by Chip Kidd and Michael Cho, Neal Adams, Joe Quinones and Maris Wicks, John Arcudi and Sean Murphy, and Howard Mackie and Chris Samnee!” Batman continues to shine as DC’s most popular character. I lose track of how many books he’s in these days, but there’s still room for one more, apparently! Fans first got to read Batman in black and white when these stories appeared as backups in the ongoing Batman: Gotham Knights comic. As its own comic, Batman: Black and White began in 1996 as a four-issue limited series with each release containing four stories by creators known for their work on The Dark Knight to those the people at DC wanted to see take their shot at the classic character. Each issue also had single-page pin-ups as well. Eventually they were collected into hardcover and softcover editions, some containing new stories. What’s interesting is that when this series was pitched by then-Batman editor Mark Chiarello, he was told by many that it wouldn’t sell because of the anthology format as well as being black and white instead of full color. Good thing DC still gave the stories a green light. Not only did it sell well, it won an Eisner Award, and the first volume was included by IGN on a list of the 25 greatest Batman graphic novels ever. It also spawned a long-lived line of statues that continues to this day! It’s no wonder DC’s bringing it back as a limited series! HOW DOES THE NEW #1 MEASURE UP? The first thing I noticed while reading this book was the continuing influence of Batman: The Animated Series. For instance, Harley Quinn and Poison Ivy continue to be gal pals. Also, there’s a Batmobile based on the first one seen in that cartoon. Roxy Rocket shows up in another story, and I guess a case can be made for Scarface and the Ventriloquist in the last tale in the book. Also, the art styles vary from creator to creator. The one that stands out most is Neal Adams’ pencils-only contribution. Chris Samnee has his first Dark Knight art published, and he uses no grey tones. The rest of the stories use grey tones pretty effectively. Cool Marc Silvestri cover, by the way! 5. “Batman: Zombie” written and drawn by Neal Adams. I love me some Neal Adams art, but I’m not nearly as enamored with his scripts. He must have had as much fun drawing Batman as a zombie as he did The Dark Knight’s rogues gallery. However, it became pretty obvious to me where the story was going on the very first page. It was interesting that Bruce Wayne could solve these problems better than Batman, and we all hope millionaires and billionaires will spread their wealth around more than they do. But the “thank goodness it’s only a dream” plot ran its course way back on TV’s Dallas. Rating: 3 out of 5 stars. This is a story where Batman disappears, so Robin must locate him. It’s reminiscent of the World’s Finest days because Superman shows up to assist the Boy Wonder, although he shows up without any explanation. I know in a short story you can’t cover everything, and maybe in the future these creators will show us what happened, but the Joker walking around with a genuine teleportation device also bothered me. Just a single line of dialogue could have fixed each of my concerns, in my opinion. Still, it’s always something special when Robin works with Superman. Rating: 3.5 out of 5 stars. It was enjoyable to see both Roxy Rocket and a Batmobile that looks like the first one from Batman: The Animated Series. Roxy tends to require a lot of action, so I loved that. The story is told by moving around in the timeline, which meant I needed to pay attention, which is always a good thing to me. It was also great to see Bruce frustrate Alfred instead of the other way around for a change. I liked this one a lot! Rating: 4 out of 5 stars. Harley Quinn robs a Gothamburger restaurant to feed her “babies,” the pair of laughing hyenas. However, when they eat the stolen burgers, they become extremely bloated and develop “plant-like protrusions.” Of course, everyone, including Harley, just knows who is behind this. Poison Ivy, right? Plants are her gig, after all. Batman doesn’t buy it, though, and when Ivy says she’s been in seclusion for months, the culprit is someone else. Just who goes to jail and who doesn’t as well as the very last panel wrap up this story just like Bruce Timm used to do it! Rating: 4.5 out of 5 stars. Someone’s killing low-level mobsters with an ax! The murderer has left behind a piece of wood that Batman examines, and it turns out to be a serious clue. I won’t give away just who’s behind this string of killings, but it’s dark and chilling while making perfect sense. Let’s just say that I love being surprised, and this one REALLY shocked me. Rating: 5 out of 5 stars. BOTTOM LINE: A GREAT RETURN FOR A GREAT BAT-SERIES! As a life-long Batman fan, I love seeing all these wonderful comics based on or around The Dark Knight. I wouldn’t mind seeing this title come out every month, but that would likely put a serious crimp in getting “name” talent working on stories. 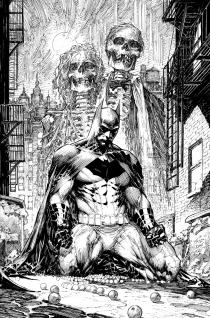 If it sells as well as I think it will, I hope we get a new Batman: Black and White mini-series once every year! It certainly seems like DC is willing to try and find out, doesn’t it? Haha. I think whether he gets over saturated depends largely on how much the reader exposes themselves to. There’s SO much Batman out there, DC could never publish another story and I wouldn’t be able to get through it all, burning myself out several times in the process.